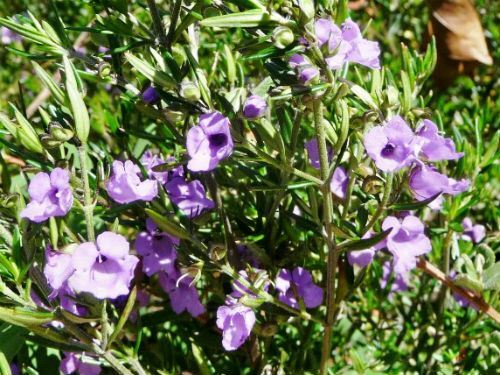 Prostanthera scutellarioides is a small to medium shrub said to reach a height of 2.5 metres. Our mature specimens are about one metre tall. The leaves are linear, pale to mid-green, sometimes curved and up to three centimetres long. Unlike most mint bushes the foliage, of this species, has virtually no perfume. The flowers are about one centimetre long, pale to deep mauve and form leafy racemes during the spring/summer flowering period. Sporadic flowering may occur at other times. During the peak blooming season plants are generous with their floral contributions. Light pruning after flowering is beneficial. Prostanthera scutellarioides is a very hardy and colourful mint bush. Unlike many of its relatives this species is resistant to wilting during dry spells. Frosts do not bother our specimens. Prostanthera scutellarioides has a wide distribution and is found in south-eastern Queensland as well as the Central and North Coast and Northern Tablelands of New South Wales. This mint bush propagates readily from cuttings. The Australian Defence Industries (ADI) site at St Marys, west of Sydney, is home to an area of the sadly diminished Cumberland Woodland. Whilst working there, many years ago, interesting lunchtime walks used to be taken exploring the local flora. Prostanthera scutellarioides was common in the woodland. Cutting material was collected and we grew Prostanthera scutellarioides in our Blue Mountain’s garden. Skip forward many years and we are living in the Armidale area. We heard rumours that Prostanthera scutellarioides grew along the Waterfall Way, east of Armidale on the banks of a number of creeks. We eventually found the mint bush in a number of sites and it is now included in our cold climate garden collection. Prostanthera scutellaroides grows naturally from Sydney to the Blue Mountains and north to the Queensland border. I have been growing Prostanthera scutellaroides for many years, in my garden in the northern Sydney suburb of Westleigh. It is a rounded dense shrub that grows to about 1.8 metres high with a similar spread and produces masses of purple/deep lilac flowers in spring. My plants are growing in a thin layer of topsoil over a clay sub soil in a well drained position and receive some additional watering in dry spells. They are very hardy and grow best in a position that has good drainage and protection from afternoon sun. The only maintenance required is to give them a good prune after each flowering to keep them compact in shape and promote better flowering next season. I remove about a third of last season’s growth. This is a plant that will grow well in shade, I made the mistake of planting one in a position that receives morning dappled shade and full afternoon sun. This caused new sappy growth to wilt. When the sun goes off the plant it recovers with no harmful effects and it still flowers spectacularly. Some Prostanthea have a short flowering time. However I find that this species flowers for me for well over a month in early Spring. Prosthanthea are interesting plants. After several weeks of hot dry weather they curl their leaf edges, start to drop their leaves and look like they are going to die. This happened to me when I went on holidays over summer. When I got home, I thought I had lost the plant. I gave it a good, deep watering and to my amazement the next day it started to recover and over the next few weeks it grew back most its lost leaves and looked as if nothing had happened to it. They clearly have the ability to go into a state of ‘suspended animation’ until rain arrives and then spring back into life. Having said that, I will not try that out on one my other Prosthanthea any time soon. Prostanthera scutellaroides is stunning in flower as the purple/deep lilac flowers contrast the small dark green aromatic leaves so well - a great plant for any shady garden. Prostanthera: from Greek prostheke; an appendix and anthera; an anther, referring to the appendage on the stamens.